First flown in May 1948 the Canberra was the RAF's first jet powered bomber. 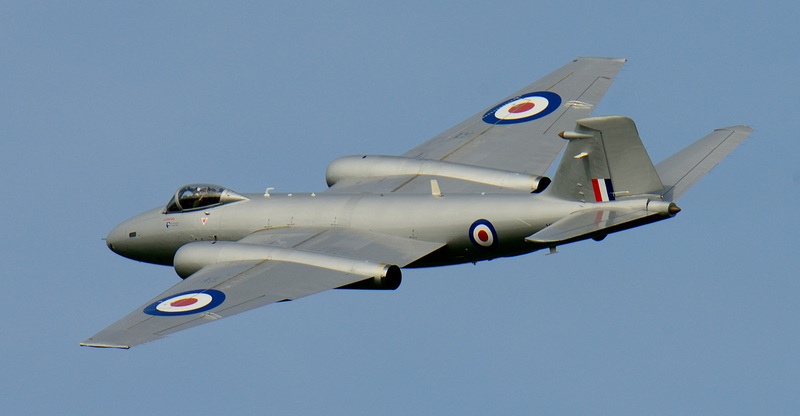 Designed like the Mosquito the Canberra used high speed and high altitude to escape the attentions of the present day fighters. The aircraft also had fighter like maneuverability and was very agile. Canberras served in all areas of the RAF's operations and was also exported to many countries including South America where in 1982 Argentinian Canberras were used against the UK's Task Force during the Falklands conflict. reconnaissance, target towing, training, and all manner of trials adaptations. The Fleet Air Arm also used the Canberra for a variety of roles. 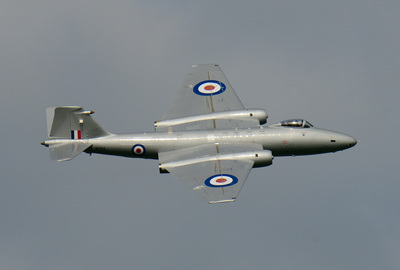 The RAF's retired its final three PR.9 variants of the Canberra on 28 July 2006. On 31 July 2006 the same PR.9 aircraft, XH131, XH134 and XH135 were flown from their home base with No 39 (1 PRU) Squadron at RAF Marham Norfolk to Kemble in Gloucestershire. 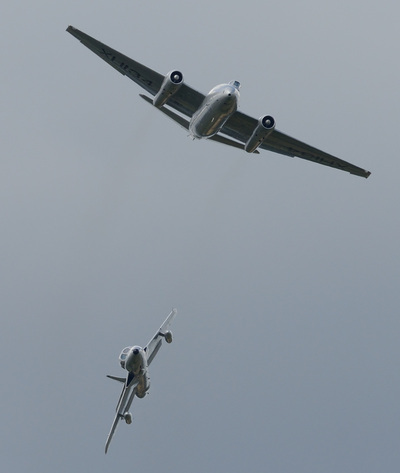 This marked the last RAF flights of the Cnaberra after nearly 55 years service. 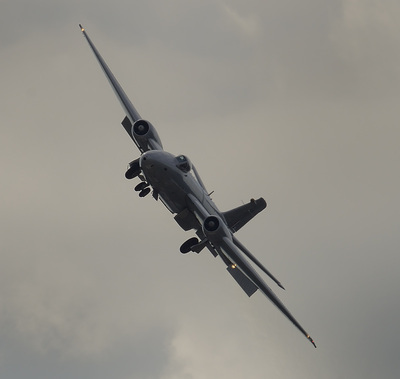 The aircraft were delivered to their new civilian owners, Midair Squadron, who had plans to turn the Canberras into digital reconnaissance platforms, a project that did not come to fruition. The aircraft remained at Kemble and following a period of overhaul XH134 was again flown on 19 July 2013. The pilot was Dave Piper who had the distinction of being the last RAF pilot to land an RAF operated Canberra following the PR.9's delivery to Kemble. The flight took XH134 to 2013's RIAT airshow where the aircraft was displayed in the static area. In September 2013 XH134 obtained Display Authorisation. This allowed the PR.9 to participate and display at future airshows but this was a bit too late for the aircraft to make an impact on that years scene. In 2014 XH134 once again appeared on the years airshow circuit with a debut at Abingdon in May. During the display the PR.9 undertook a high speed pass which truly summed up the Canberra's elegance and power. As 2014 progressed XH134 was joined by Hawker Hunter T.7 XL577, also owned by Midair, and the two aircraft displayed as a pair. 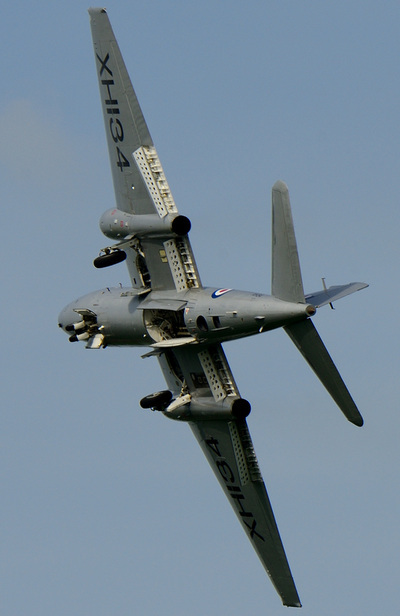 XH134 appearance on the UK's airshow scene has been welcomed by enthusiasts and the public alike, however, by March 2016 the aircraft, along with two Hunters, was up for sale and its future at present looks uncertain. Midair due to mounting debts have been put into receivership and as yet XH134 remains unsold.